It may look like the SR-71 Blackbird, but this sleek flying beast is not the most famous supersonic spy plane ever created but its father, the A-12 Oxcart. In some ways, it was a better machine than the famous Blackbird. This is its history. The story of this Mach 3.2 technological wonder starts in 1957 and, like all secret flying things full of gadgets, it's fascinating. The OXCART program story began in 1957, when a contractor suggested that high-altitude supersonic flight was the only way to avoid Soviet air defenses. The CIA's Richard M. Bissell, who was directing the 1954 U-2 spy plane program at the time, was concerned about their vulnerability to USSR radars and anti-air missiles. He was right: in 1960 the Soviets shot down Francis Gary Powers' U-2 near Sverdlovsk. By then the A-12 program was already under way: after Lockheed Aircraft completed "antiradar studies, aerodynamic structural tests, and engineering designs," the CIA gave the green light to produce the 12 aircraft on January 30th, 1960. It was still called the A-11 at the time and Lockheed engineer Clarence L. Johnson was the main designer. He also was responsible for the U-2 but, for some reason and after months of drawings and wind-tunnel model testing, people were still not convinced this beast could fly. It did, but only after years of tests and adjustments. It was a difficult path. The aircraft skin, for example, had to made out of a titanium alloy, as it had to resist 550 degrees Fahrenheit temperatures while flying at top speed. The aircraft manufacturing process, which at that point only used aluminum frames, was an absolute nightmare. All machinery broke trying to work the titanium and new tooling parts had to be designed and created from scratch. As a result, each plane had to be hand-crafted. The quest to make its radar signature was also painful. For one year and a half, a full- scale model of the plane manufactured with new radar-absorbent materials was tested. Sitting on a pylon in a secret base and after countless adjustments, it was discovered that adding some big metallic parts to each side of the fuselage reduced the radar footprint. Johnson thought it was going to harm the aerodynamics but, in later flight tests, it was clear it helped the lift. It was all part of the quest for radar invisibility but, years later, these features were used by Lockheed in other supersonic designs. 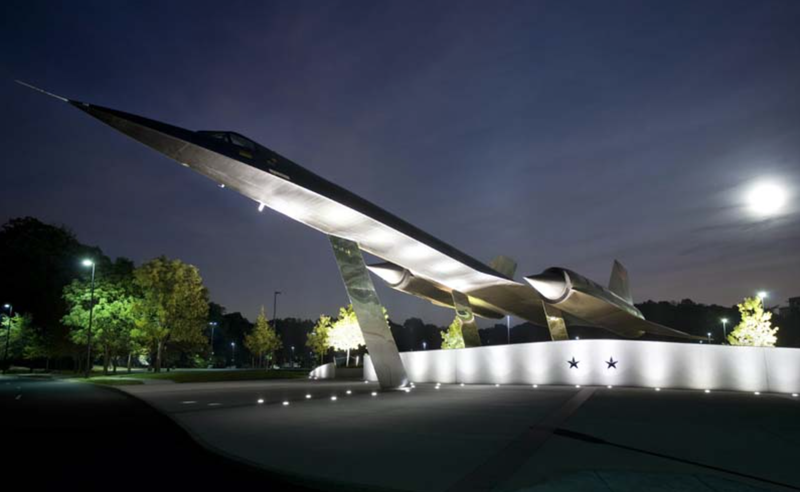 As a result of all these changes to its original design, the plane got its final designation: the A-12. The interior of the plane was also quite problematic: For reasons of weight, the plane had to be constructed without almost no thermal insulation, converting the cockpit into a true oven. As a result, the pilot had to use an astronaut-like suit with its own refrigeration system. And probably Clint Eastwood's Firefoxy asbestos underpants too. Pilots would typically lose up to 5 pounds in a four hour flight. Even the runway had to be specially created for the OXCART program. The initial test ground strip at a secret location in the Nevada desert (the CIA document doesn't mention it but it was probably Area 51) was only 5,000 feet long and incapable of supporting the weight of the A-12. Great for for UFO landings, but it needed pouring 25,000 yards of concrete to achieve the necessary strength and 8,500-feet length necessary for the A-12's take-off and landing. However, at the end everything was solved and the pilots, who had to be six feet tall, under 175 pounds and come with The Right Stuff were selected: William L. Skliar, Kenneth S. Collins, Walter Ray, Lon Walter, Mele Vojvodich, Jr., Jack W. Weeks, Ronald "Jack" Layton, Dennis B. Sullivan, David P. Young, Francis J. Murray, and Russell Scott were the heroes' names, chosen to test this wild beast. On April 26th 1962, the A-12 took to the skies. Louis Schack piloted it during its first 40-minute unofficial maiden flight. Four days later, he also took her into its official maiden flight for 59 minutes. It wasn't until May 4th that the A-12 broke the sound barrier for the first time, reaching Mach 1.1. During 1962 the aircraft kept evolving during flight testing but it wasn't until 1967, after countless delays caused by political discussions and a couple of accidents, that the A-12 was employed in real missions. The target: Vietnam. The first mission was flown on May 31st 1967 and it accomplished all objectives. The A-12 force kept flying successfully, but was retired in 1968, when the SR-71 Blackbird took its place. Of the final 15 A-12s produced by Lockheed, five were lost and two pilots were killed. It may seem like not a lot was achieved, but this aircraft pushed the envelope in every way imaginable making many of the common concepts of modern supersonic aviation possible, from aerodynamic design to life support systems an specially manufacturing processes. As Ken Collins —one of its pilots— said during the recent unveiling ceremony by the CIA at Langley: "It was a beautiful airplane, it was a beautiful airplane to land, and just technically a fantastic airplane to fly." Ten planes survived the 15-plane OXCART program, one of which you can see on the deck of the USS Intrepid in New York City. Wing Span 55.6 ft. 55.6 ft.
Wing Area 1,795 sq. ft. 1,795 sq. ft. Length 98.75 ft. 103.8 ft. Empty Weight 60,000 lbs. 67,500lbs. Gross Takeoff Wt. 120,000 lbs. 152,000 lbs. Sensor Payload 2,500 lbs. 3,500 lbs. three electronic warfare (countermeasures) systems, "CFAX, APR 27 and System 13C"
The engines on the SR-71—the Pratt & Whitney J58—were also more powerful than the Pratt & Whitney J75 on the first five A-12 Oxcarts. The following A-12s used the J58 too. This is a version of a story that ran on September 21, 2007.